Tidbits: Fisher Communications, TechFlash, Snow Leopard, etc. The Board believes it is imperative to diminish the inevitable distraction of the Executive arising from the personal uncertainties and risks created by a pending or threatened Change of Control, to encourage the Executive’s full attention and dedication to the Company currently and in the event of any threatened or pending Change of Control, and to provide the Executive with reasonable compensation and benefit arrangements upon a Change of Control. IANAL, but the document indicates that in the event of a change in control, Colleen Brown will receive 2x her annual salary plus any optional bonuses then in effect, and other execs will get 1x their annual salaries plus their optional bonuses. These terms are generous, in my experience. If you know anything about this, drop me a line at john at seeknuance dot com. Or if you prefer, tack on a comment to this post. In my desire to find new employment, I’ve considered local broadcast and media companies. My recent Plone work for Fisher Communications, which included a project to move their sites onto an in-house installation, led to my discovering an interest in CMSs. Before Fisher, I’d never worked on one in a commercial project. Another “traditional media vs. the Internet” corporate situation would be fun, and I ought to be an interesting candidate to such a company. Unfortunately Fortunately, Seattle has two examples of a traditional media outlet being forced moving onto the Internet. Both result from the demise of a local newspaper, the Seattle Post-Intelligencer. This is interesting from multiple angles: Seattle news, hyper-local news, career, CMS applications, and applying Plone. SeattlePI.com was the Seattle Post-Intelligencer’s web site. It’s the newspaper’s only remaining presence, and is attempting to transform into an entirely digital news product. The Seattle PostGlobe is a nonprofit, 100% volunteer venture by ex-Seattle P-I employees who either didn’t want to work at SeattlePI.com, or weren’t offered positions there when the newspaper folded. N.B. I have no inside knowledge of, or contacts within, SeattlePI.com or Seattle PostGlobe. My conjectures are based on my observations and information from third parties. Idealware has published a report comparing four open-source CMSs. 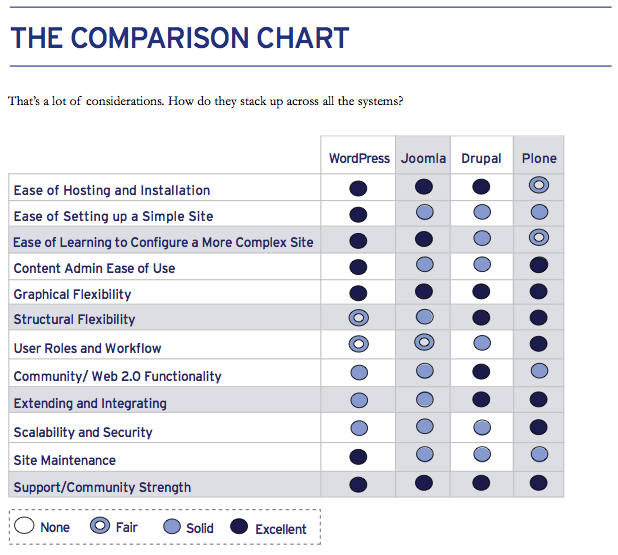 Its title: Comparing Open Source Content Management Systems: WordPress, Joomla, Drupal and Plone. (Is that a straightforward title, or what? Heh.) I read about it in a few blogs I follow. I did a little searching and found some relevant posts on this question. The plural of CMS is CMSs. The possessive plural is CMSs’. KOMO news is the first site to receive it. Go there now, and you’ll find “Comment()” links after each story summary. Go to a story, and you can comment on it.